I fish the waters of Queens,Luenburg,& Shelburne counties. If you go under my f favorite spots you will see lakes from those three counties. I am still checking out new lakes every year .A good fisher is never satisfied. Our fresh water species are brook trout, brown trout, rainbow trout (stocked), smallmouth bass,chain pickerel, white perch, yellow perch, brown bullhead, eels. 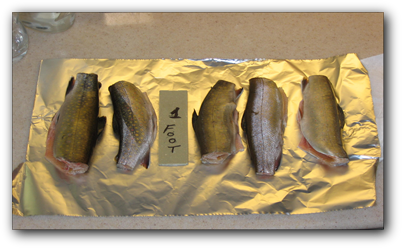 The most fished for species are brook trout, from April 1st till the water warms too much to have a good success rate, then we switch to smallmouth bass. Chain picker ell can be fished year round in some lakes. If you're unfamilar with this species, they look very much like a smaller version of a northern pike. They can grow to thirty inches or more and as much as three or four pounds in Nova Scotia. A smaller pan fish is the white and yellow perch which can be fun to catch as well. When the water warms enough, the white perch start to school. Usually, when you hit white perch, you're in a school and they can come one after another. Brown trout & rainbows are not native to the province, but browns were put here quite some time ago. The Mersey river is one of the best known spots in Queens county for browns. They still stock a few hundred fish every year. The closest lake with rainbows in it, to me is Hidden Hills Lake. This is only a small lake just off one side of Molega Lake, and it can be fished from shore. 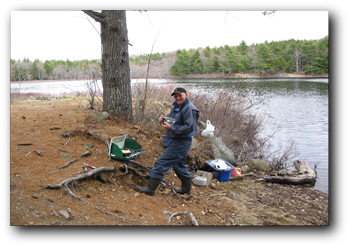 The rainbows are also used for a winter fishery with the daily bag limit reduced to two, during Jan.,Feb., & March. Sucker Lake in Luenburg county is also a rainbow lake. This lake is bigger but is also used for the winter fishery. As far as brown bullhead are concerned, they are considered more of a nuisance but there are quite big numbers of them in some of the lakes. Eels are fished commercially with weirs in low water late in summer but their numbers have been on the decline ever since the elver fishery has begun. This is a fishery of fishing for baby eels, it sure has cut into the adult population .There are places you can have some fun catching eels, if you like that kind of thing .Yellow perch can also be caught year round but our yellow perch are fairly small.